Mario LOVE LOVE LOVES pasta x i kinda do too. I lie … I luuuuuhh pasta (prob too much but not as much as corn x Mexican food!!). I still don’t know where my obsession with corn came from.. whelp! 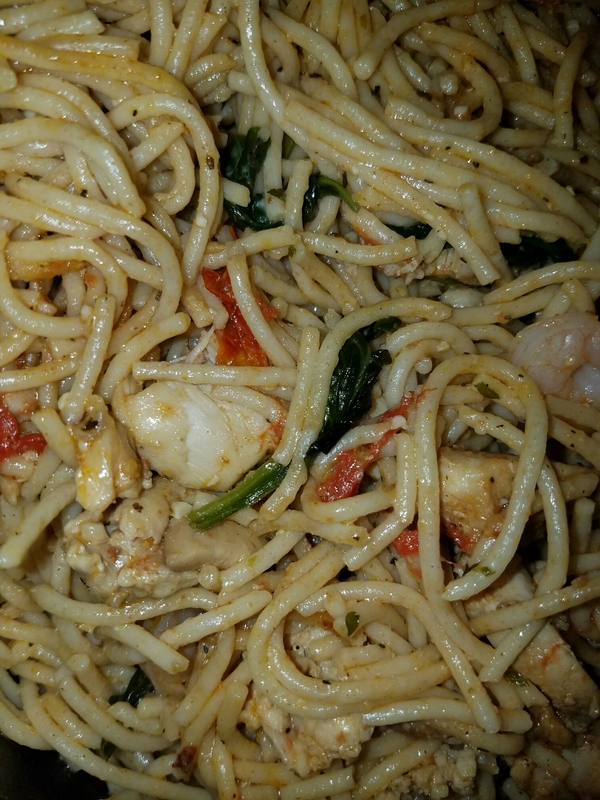 So I made this light, tasty, wine-infused pasta tossed with garlicky cherry tomatoes, garlicky chicken, some leftover shrimp from egg rolls I made (recipe coming soon), spinach….. i KNOW, it does sound DELISH, so lets get into it! 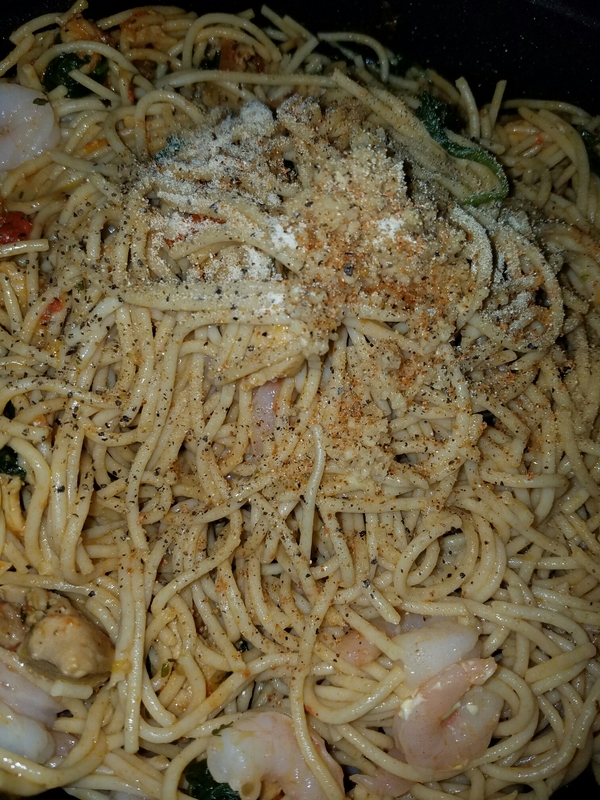 Ingrediants: Spaghetti noodles, shrimp, chicken thighs, fresh spinach, cherry tomatoes, your favorite seasonings, dried parsley x basil, minced garlic (a lot!). Boil pasta (wheat for me, please!) according to package. Set aside. Cut chicken thighs in slices, season with your favorite things and sauté in olive oil. After your chicken is cooked thoroughly, add in a scoop of garlic x then add in sliced (in half) cherry tomatoes. Let your tomatoes cook down, add about two teaspoons of butter and it will start to make a slight ‘roux’ … sprinkle salt and pepper to taste. Add two more scoops of butter and your favorite white wine.. this will make a reduction. Look at me using those chef-like words… mkkkkaaayyy! Next add in your noodles of choice, 2 teapsoons of Olive oil x top with seasonings! I had some leftover baby shrimp that I used for my ‘Southwest Egg Rolls’ so I tossed those in as well! Fold everything over with tongs! Hope you liked this dish!! Remember, you can always sub out meat and just add more veggies. Use a ‘butter’ alternative if you have removed dairy from your diet. Don’t forget to comment, share and let me know how your dish turned out! Coming Soon: Breakfast Bake — You can surprise your boss with breakfast!